Visitors are welcome at all meetings. 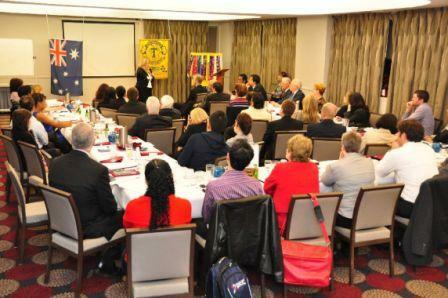 We meet at the Parramatta RSL Club, 2 Macquarie Street, Parramatta. Before attending though, please complete this simple registration form to assist us with planning for your visit. Free parking is available in the RSL Club's parking building across the road from the Club. The RSL Club's phone number is 9633 5177. 1st and 3rd Thursdays of each month plus an extra meeting once a quarter on the 4th Thursday on months having 5 Thursdays in them. Pre-meeting arrangements start at 6.00pm. With over 30 people normally in attendance, this allows time to order meals and drinks, meet people and to make other arrangements. These need to be completed and everyone seated for the formal start of the meeting at 6.30pm. With this in mind, you should not arrive later than 6.20pm. If for unforeseen circumstances you are running late, please call Sam on 0409 454 567. On average between $15 and $25 for dinner, depending on menu choice, or $5 if not eating. Note that on ordinary meeting nights, there is no cost for first time visitors who are not eating. For further information and to confirm attendance, please complete this simple registration form to assist us with planning for your visit. For further information call Michael on 0419 522 949. At Parramatta station, exit on the south side to Argyle Street and start walking westwards (downhill) parallel to the station/railway line. At the first traffic lights turn right under the railway line and walk through the Mall in front of the Town Hall. The first road crossing the Mall is Macquarie Street. Turn left on Macquarie Street and cross at 2 traffic lights. The Parramatta RSL Club is on the right side of Macquarie Street with a traffic light controlled crossing in front of the Club. The total walk from the station takes about 8 minutes.